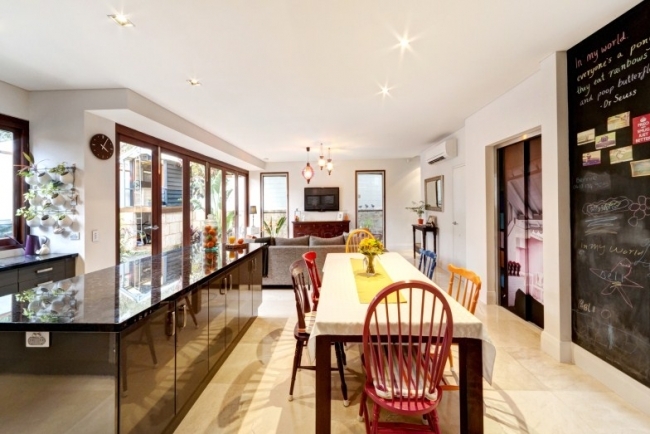 I love this beautifully renovated house. 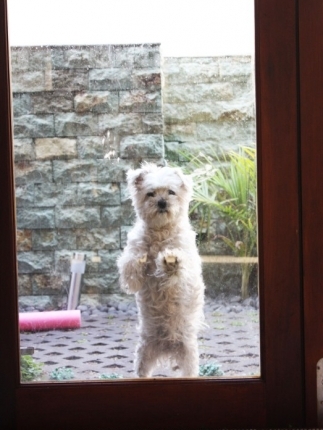 It won me over just moments after I knocked on the front door - answered by a tiny blonde girl in pink pyjamas and freshly washed damp hair, who carefully and slowly wound up the blockout blind, inch by inch, before heaving open the huge door and politely inviting me in. 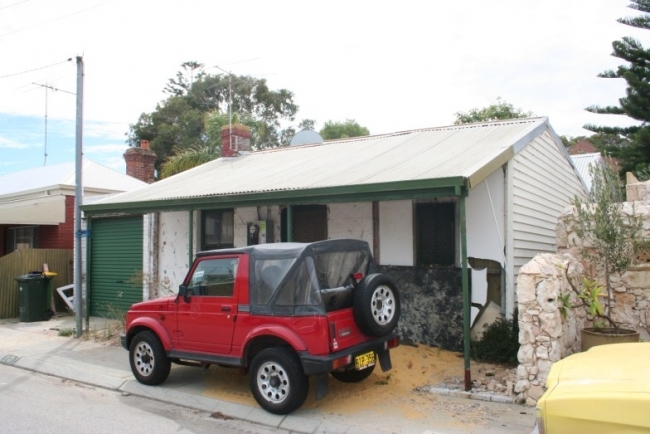 This was my introduction to seven-year-old Audrey and her family - parents Grainge and Jess Ryall, who own this gorgeous Fremantle house, Audrey’s brother Oscar, 5, and baby sister, Suki, 10 months. 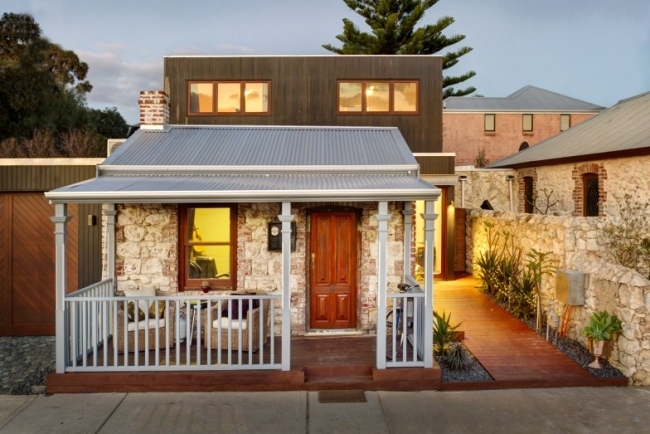 They live in this three-bedroom Fremantle home with British shorthair cat Britney (named by the kids, as you may have guessed) and Jess’s original babies, dogs Taj and Bella (named before Bella Swan). ABOVE: The 1890s stone cottage is complemented by the cedar-clad extension at the rear. Squint Photography. The house today. Squint Photography. 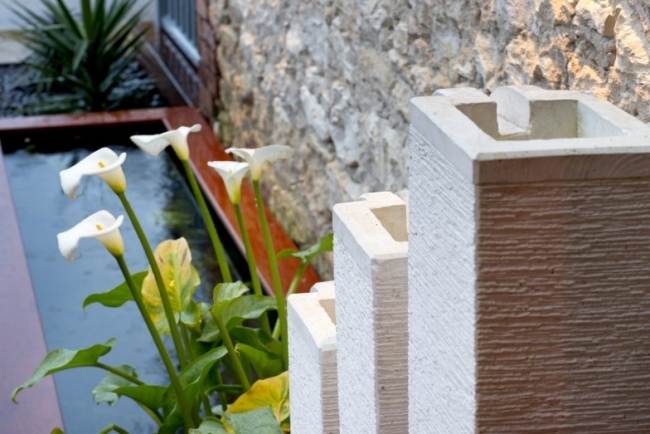 ABOVE: The water feature against the old cottage. 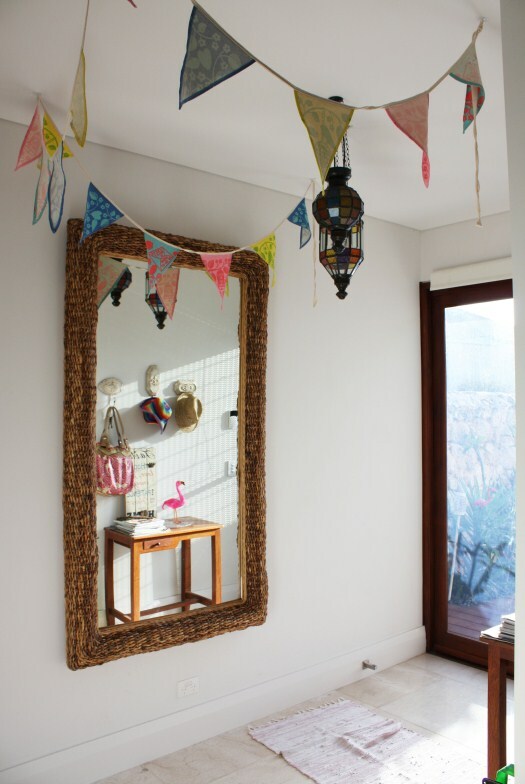 ABOVE: Jess loves flamingos, as obvious by the entry foyer. The little flamingo and bunting was from Corner Store. 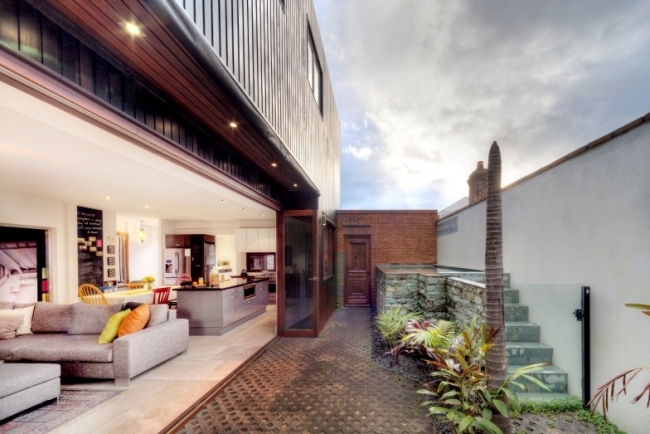 ABOVE: The entry flows straight into the open-plan, contemporary living extension. Squint Photography. ABOVE: The cedar-framed glass doors can be pushed back for indoor-outdoor living. ABOVE LEFT: I liked Jess's hand-stamped text to the toilet! 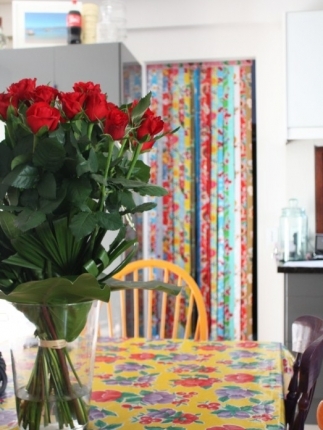 ABOVE RIGHT: Mexican oilcloth adds bright colour to the neutral interiors. Seen here in the form of a tablecloth and concealing the laundry from the kitchen. The tablecloth and door screening were from Corner Store. 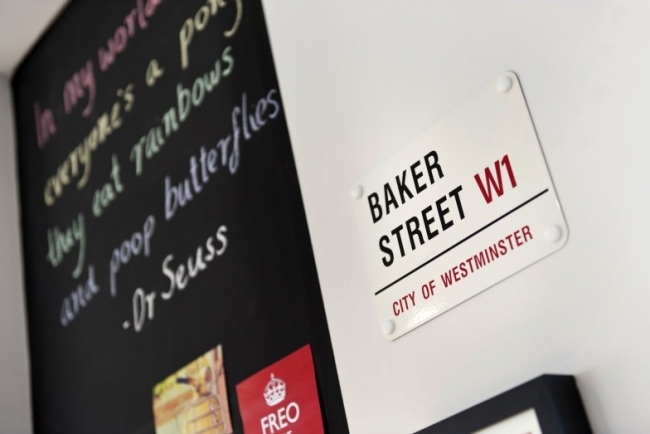 ABOVE: A chalkboard wall in the dining area. Professional photography by Squint Photography www.squint.com.au. 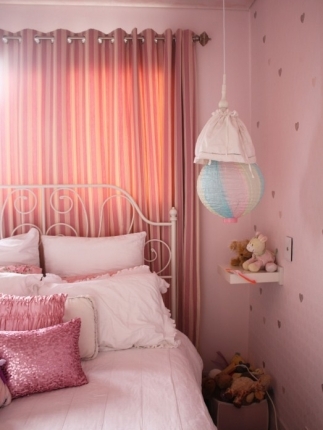 ABOVE LEFT: Audrey's pretty pink room. Staircase photo by Squint Photography. 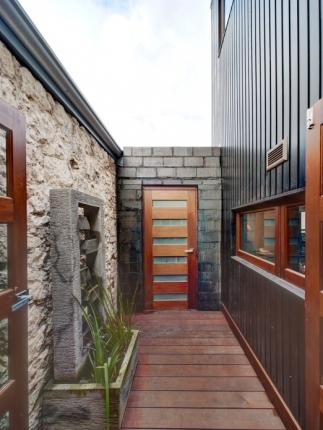 ABOVE LEFT: Cedar-framed bi-fold doors, stained a rich hue, open off the living area to the courtyard garden with plunge pool. 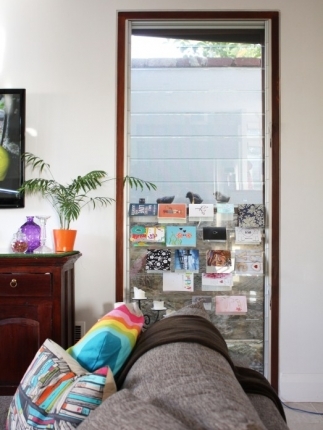 ABOVE RIGHT: Jess displays the cards she and Grainge received from their 10th wedding anniversary in this louvred window. 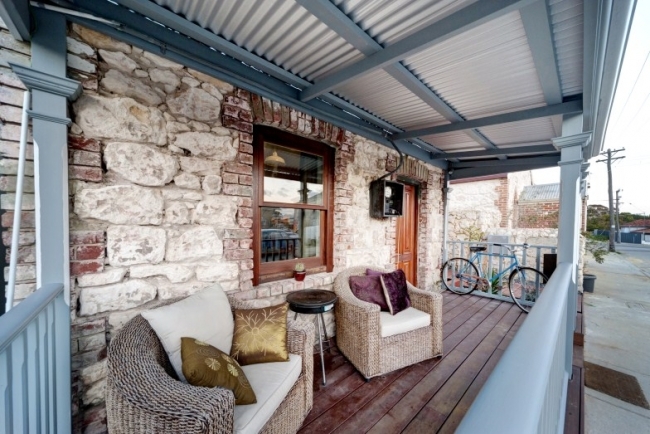 Grainge had always wanted to live in Freo (me and Mr House Nerd have always wanted to, too) and after renovating numerous homes the Ryalls’ chance eventually came to buy and extend this one. 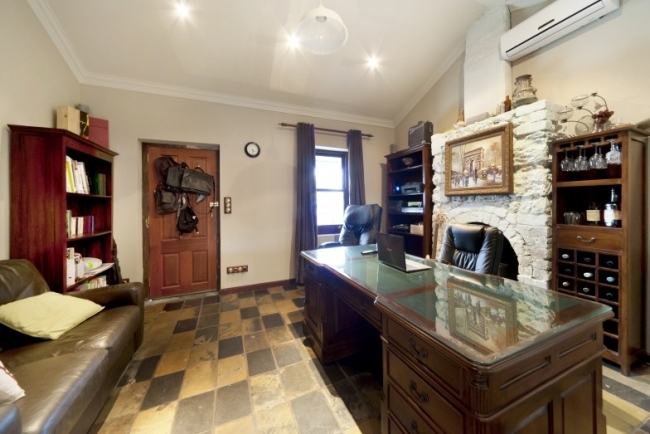 Thought to have been built in the 1890s originally as a stablehand’s cottage, the original stone residence had been added onto numerous times over the decades, including in the 70s, and is heritage listed. With strict restrictions on the site, the design phase and the build were not without challenges. The Ryalls enlisted the expertise of design and architecture firm Fratelle Group to design the extension – keeping the original stone cottage and its veranda, using its stone walls in mind as inspiration, and removing the shabby add-ons at the back to make way for a contemporary new two-storey addition with an open-plan living area on the ground floor with a main suite, two children’s bedrooms and a family bathroom upstairs. ABOVE: The old veranda of the stablehand's cottage. ABOVE: The original stablehand's cottage is now a cozy lounge/study/theatre room for Grainge and Jess to escape for some rest and retreat. The old fireplace was painted in Berwick paint. 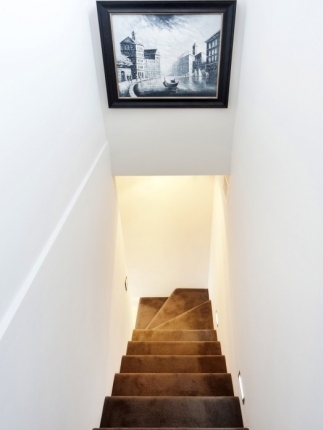 ABOVE: I grew up in an older house that had been added onto numerous times over the years, with lots of little corners, corridor twists and tucked-away rooms. I think it explains my love of unique homes with quirks in their layouts. With very strict council restrictions placed on this tight site, designer Adrian Fratelle of Fratelle Group had to think outside the box to create a layout that was practical for its family of five while adhering to council laws to visually define the original stone cottage from the new extension. 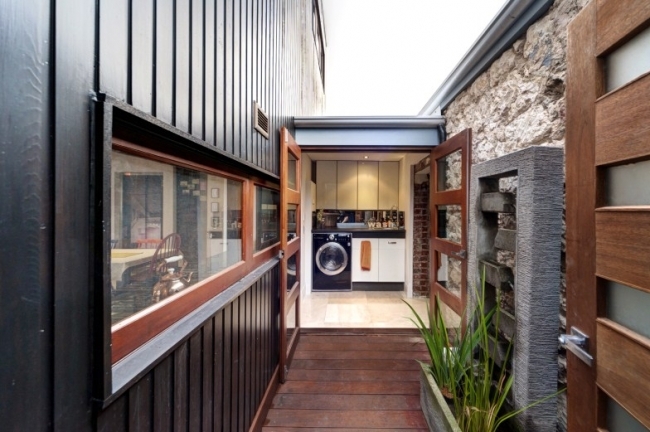 The solution was to make the laundry off the new kitchen a thoroughfare to the cottage with an atrium-style drying courtyard dividing the old part of the house from the new, while also flooding the laundry and kitchen with natural light. While unusual to access your lounge room through the laundry, in this unique case I think it was the best design solution they could have come up with. And I like a bit of quirk in a house! ABOVE LEFT: The laundry drying courtyard with water feature. How many drying courtyards are this pretty? 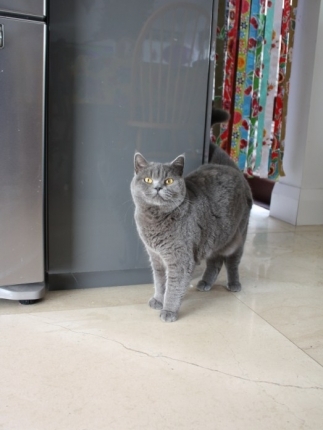 ABOVE RIGHT: Mexican oilcloth covers the laundry entry, behind British shorthair Britney. BEFORE: The back of the house as it was - a hodgepodge of additions accumulated over the decades since the stone cottage was first built. TOILET CONTROVERSY: It might sound a bit weird to have a heritage-listed toilet, but in this part of Australia, it's not unheard of to have freestanding outdoor dunnies that are protected along with the original house. There was one such dunny in Jess and Grainge's back yard. Dilapidated, disused and crumbling to pieces, it would have cost a small fortune to restore, but worse yet, it was in a spot that would have meant it would have been sitting in the living area of their home had they retained it. 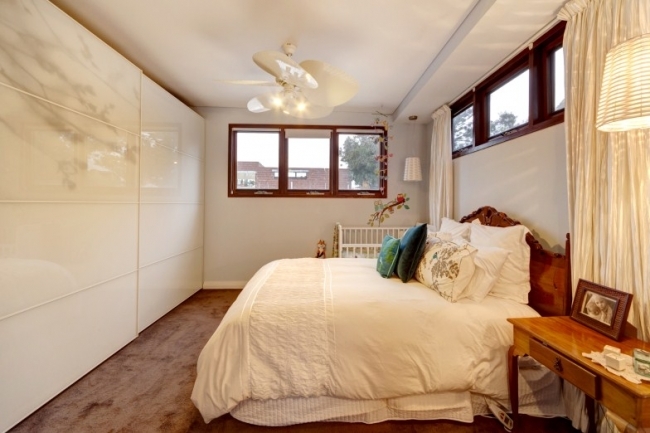 And on a small, tight block that already has extensive restrictions placed on it, space is everything! 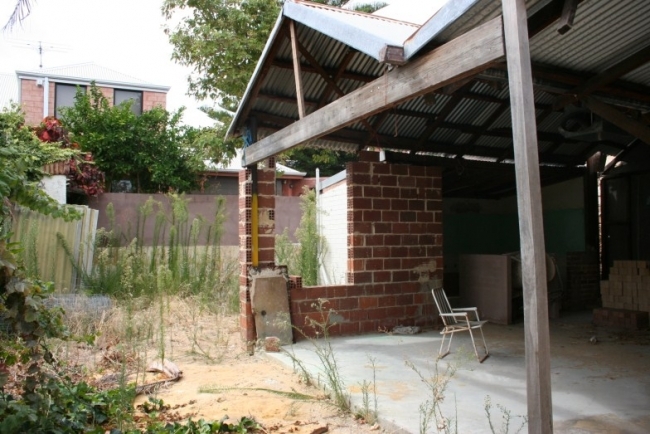 So they decided to knock the old toilet down - and had to pay a whopping $10,000 fine! 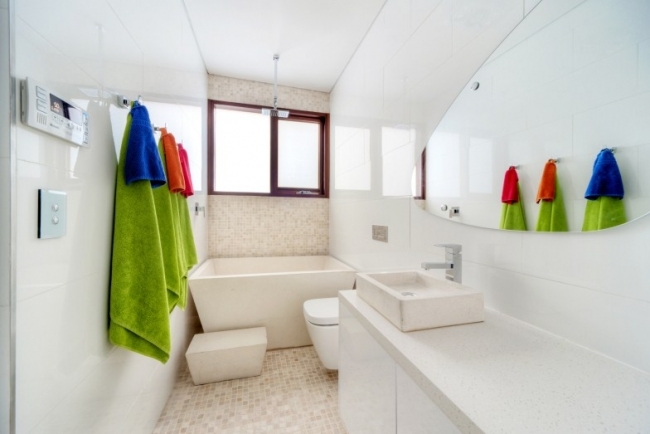 Would you have done the same to make your home the best and most functional it could be? While I think the council does great work, I think sometimes it needs to look at renovation projects such as this one more on a case-by-case basis, especially when the structure has disintegrated so badly it makes little sense to try to fix it and it impacts modern-day functionality. 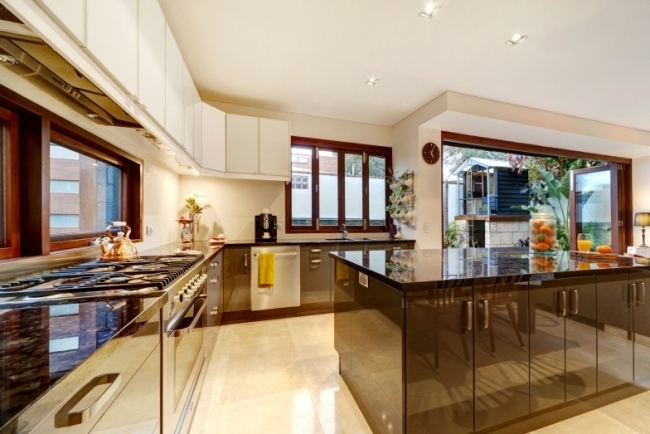 ABOVE: The new kitchen with granite benchtops. 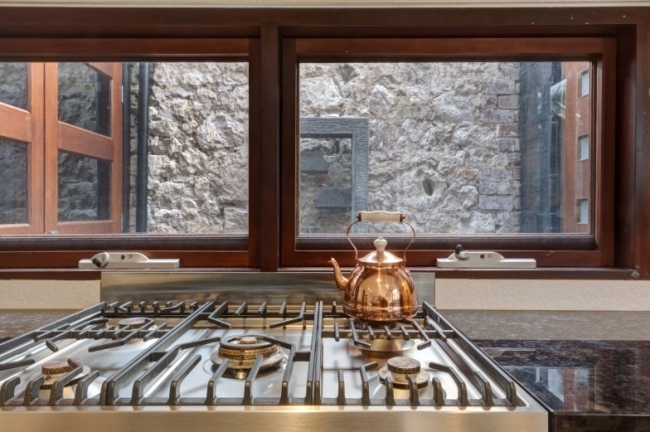 ABOVE: The new kitchen has windows on two sides, one overlooking the pool, the other the very pretty drying courtyard. 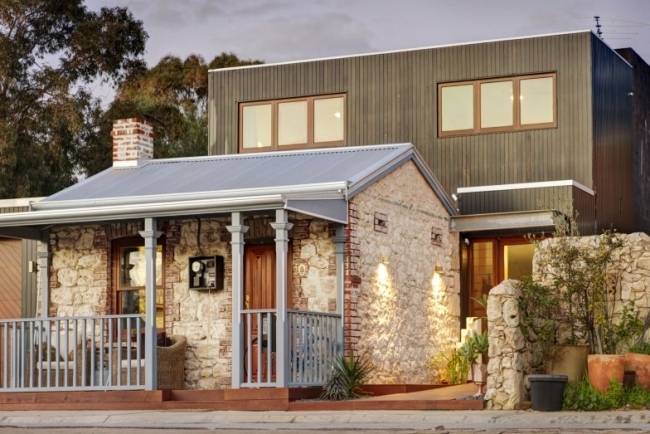 Minutes from the heart of Fremantle on a quiet no-through road, this is a house that feels warm, welcoming and homey and cutely chaotic with kids and animals running around everywhere. I thought Jess must have worked in interiors because she is bold with colour and pattern and it works. 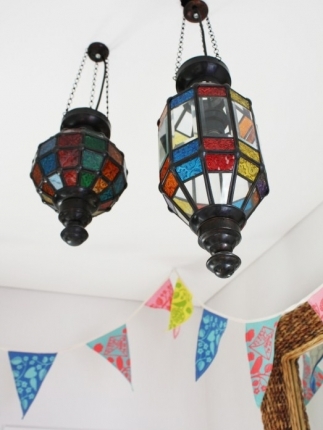 Moroccan lights mix with bunting, vividly coloured Mexican oilcloth and a flamingo theme. “I went a bit crazy with the flamingos,” she laughs. You cannot walk into this cheerful house and not smile. 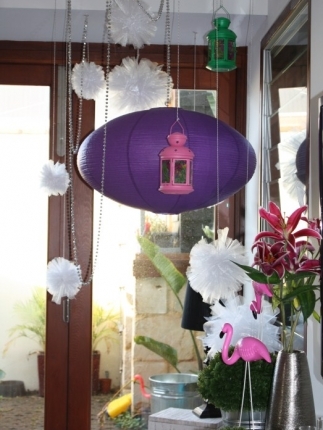 ABOVE: Colorful ceiling hangings include Moroccan lights and festive paper art. ABOVE: The Ryalls went to Bali and brought back a crate of stone for their house, including the stone tub, step and basin for their family bathroom. ABOVE: The main suite when Suki was still in it too. I couldn’t believe that the robe with feature screen in Jess and Grainge’s room was from IKEA. I hadn’t seen anything like it before and it looks a million bucks. 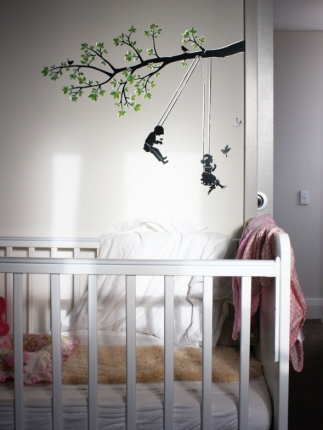 Jess says initially she would wake up in the morning and think that the print was the silhouette of the tall trees beyond the bedhead wall! 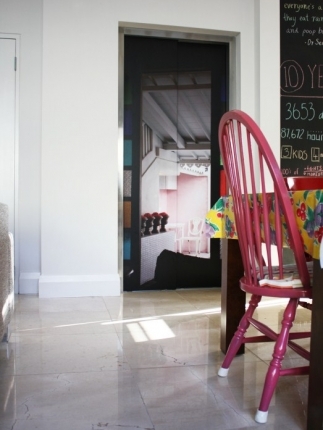 ABOVE LEFT: The lift in the Ryalls home, from Grainge’s business City Lifts (www.citylifts.com.au) was covered in a photo of Café Bali in Seminyak from Marco Attrill Photography. ABOVE RIGHT: Grainge and Jess's lovely ensuite. 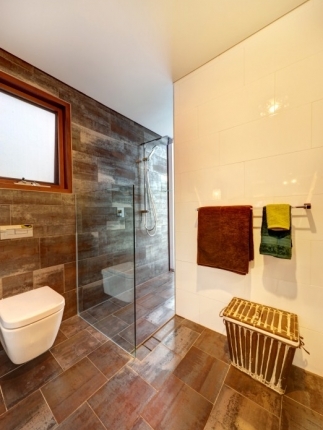 A white glass full-height window to the shower area floods the room with natural light. 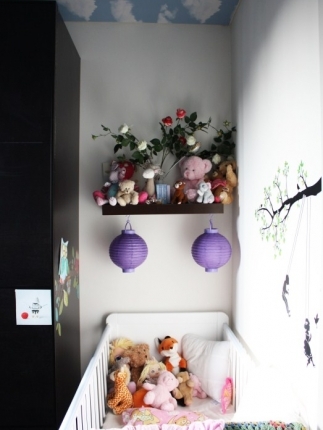 ABOVE: Suki and Oscar's room. ABOVE LEFT: The ceiling in Oscar and Suki's room. 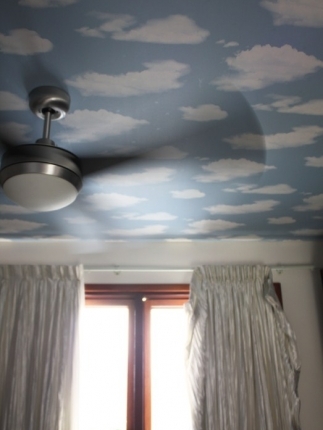 I would have killed to have this sky wallpaper on the ceiling when I was a little kid! I went through a phase of wanting a sky-themed bedroom. The Ryalls picked up the wallpaper in Bali. 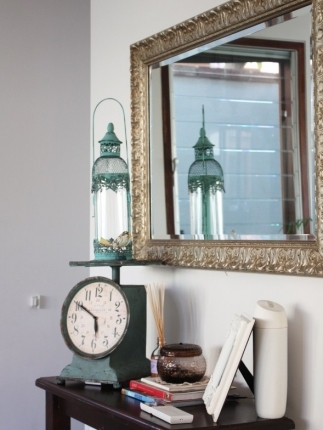 ABOVE RIGHT: A mirror in the living area reflects the garden and enhances the sense of space. 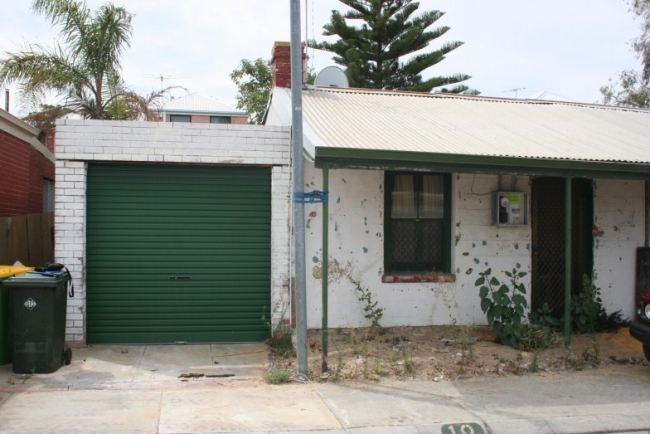 Would you sacrifice size and have a smaller house for your dream suburb? 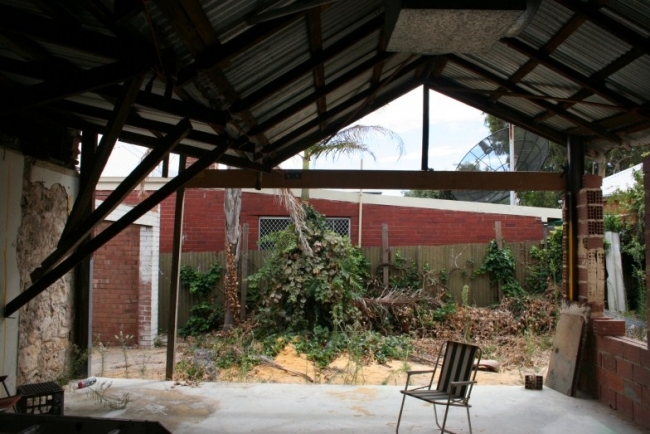 Would you buy a heritage-listed house and go through extensive council proceedings to get your plans approved, or would you never buy a protected place? 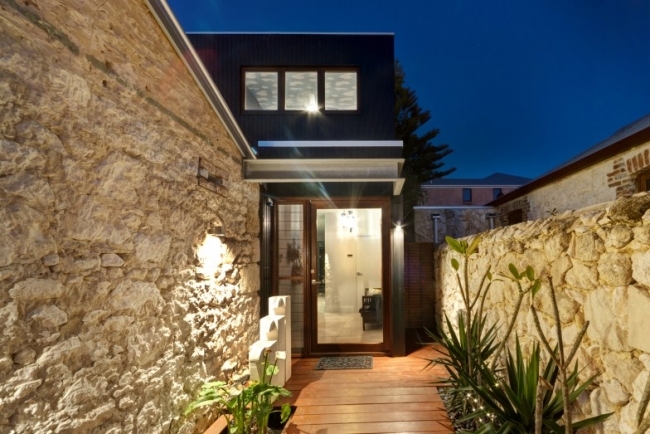 Would you also have knocked down the crumbling outdoor toilet to create a more functional family home? Leave your thoughts! The stone cottage complemented by the cedar cladding of the new extension. The Ryalls did this owner-builder! I was so impressed. Professional photos by award-winning Squint Photography (unprofessional pics by me). What a difference compared to the before photos. They have given life back to this house and should be proud. I wouldnt have done anything different. Wow! This house is immaculate! I like the small features that make it really warm and friendly. And the bunting! Bunting is big over here. I didn't even know what it was until recently. I LOVE bunting! I have bunting in my house right now (Christmas-themed bunting my mum stitched for me). 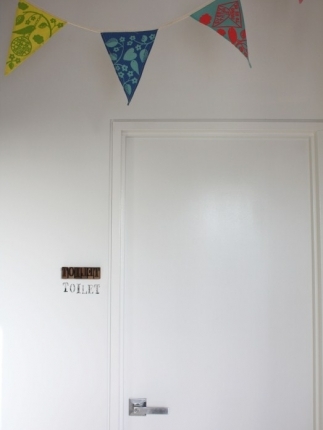 And I had pink bunting up at my last birthday. It is the best, it just makes everything feel so festive and cheery straightaway :-) And Emma I agree! Beautiful reno on a tired-looking old house. Cool!! What sort of timber is used for the cladding? Hi Graham! I am pretty sure it was cedar and painted that lovely deep charcoal colour. But I have shot Adrian an email to ask if he knows for sure! Oh wow, I absolutely love this house. It's amazing!